Ford has been testing the vest at two plants in Dearborn for the past 16 months. Thanks to the success of that trial -- where employees used the vest during 86% of their shift -- the automaker is expanding the use to 15 assembly plants around the world. Those using the vest are only a small portion of the assembly line. "Today, it's only the passive upper-arm support skeleton that helps with overhead work," By rolling out exoskeletons now, it's able to set up a system that can be augmented or grown as the technology matures. People still build cars. While videos of giant robots welding vehicles are exciting to watch (sparks! ), humans are an important part of the assembly of vehicles. However, as you would expect, doing the same thing over and over often leads to injuries. For workers reaching up all day, that motion can be especially hard on their shoulders. 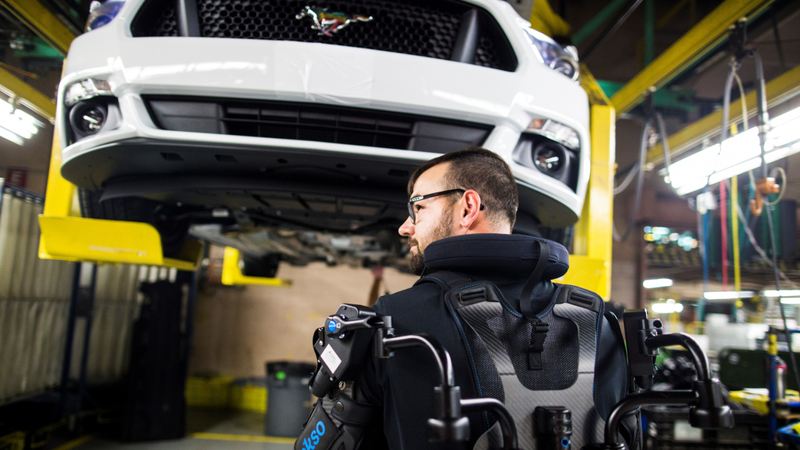 To help, Ford will be offering exoskeleton vests to folks in 15 assembly plants around the world. The EksoVests (built by Ekso Bionics) are available for employees that have to reach overhead multiple times a day. The exoskeleton vest doesn't have a motor or battery pack to make its wearer stronger. Instead, it's a mechanical device that offers passive arm support from five to 15 pounds. As the person reaches up, the vest offers their arms additional assistance. The higher they reach, the more support the system adds. "It's not a strength enhancer, it's an endurance enhancer," Marty Smets, Ford's technical expert of human systems and virtual manufacturing, told Engadget. Ford has been testing the vest at two plants in the Dearborn, Michigan area for the past 16 months. Smets said that thanks to the success of that trial -- where employees used the vest during 86 percent of their shift -- the automaker is expanding the use of the vests to 15 assembly plants around the world. long-term with these vests. By rolling out exoskeletons now (even at a small scale), it's able to set up a system that can be augmented or grown as the technology matures. "We wanted to focus on one exoskeleton initially, then expand from there as the space grows," Smets said. Hopefully, that means more people that build the cars we drive will be less likely to be injured on the job.